Jes is looking for a loving and happy home for her two babies while she attends basic training for her new position in the military! 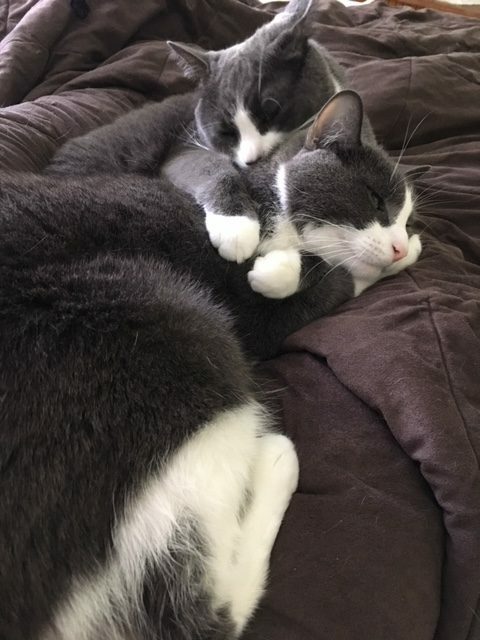 These two furballs are inseparable! They are looking for a house all to themselves, without any other pets. Dusty and Storm love to feel supported, and are looking for someone to look after them from 6/1/2019 – 6/1/2021. Dusty is a 5 year old neutered domestic short haired cat. He is known for loving cuddle sessions and always seeking out attention. Dusty will quickly become your best companion as he will be your shadow around the house all day. He does get scared around loud noises, and is looking for a patient foster who will provide a calm environment. Storm is a 5 year old spayed domestic short haired cat. She is full of energy and loves to explore new things! Playing with q-tips and pipe cleaners is one of her favorite activities, as she always needs to be entertained. Storm also loves to soak up the sunshine with her owners. If you have a spare sunny windowsill, please consider offering Dusty and Storm a place to stay! Other dogs: No dogs please! If you are interested in fostering pets like Dusty and Storm, fill out a Foster Family Application. If you are interested and have already completed your Foster Application, please email info@pactforanimals.org and let us know!